I love Columbia products. My closet is full of Columbia clothing, jackets and footwear. The reason I like Columbia is that their quality has greatly improved through the years and now nearly matches the quality found on many premium brands. However, the prices for Columbia clothing and footwear are still quite affordable—generally far less expensive than premium brands. Columbia products are also widely available both online and offline, making it easy to buy them in the size and styles I want. The small line of winter boots from Columbia are just that—winter boots. Columbia doesn’t yet make snow boots, or boots designed for wading through deep snow. Instead, the best way to look at Columbia winter boots is that they are designed for a wide range of winter activities (especially hiking) in cold weather which doesn’t involve wading through deep snow or deep water. Of course, a separate snow gaiter can be attached to the boots to allow for wading through deep snow. 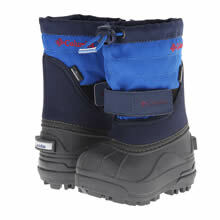 But unlike the snow boots from Baffin or Sorel, the winter boots from Columbia don’t have a built-in snow gaiter. Columbia makes a wide variety of hiking boots, but their winter boots are a bit of a specialized line. Unlike other manufacturers, they don’t have dozens of different types of winter boots. Instead, Columbia’s primary winter boot consist of the Bugaboot line of boots, which come in a number of different styles. Each Bugaboot style is designed similarly but differs in the amount of insulation used—leading to different temperature ratings. 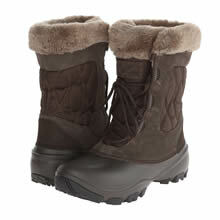 A few other styles of winter boots from Columbia, particularly for women, are also available - such as the Ice Maiden II. However, for a pure winter boot, the Bugaboot line is the boot of choice for both men and women. 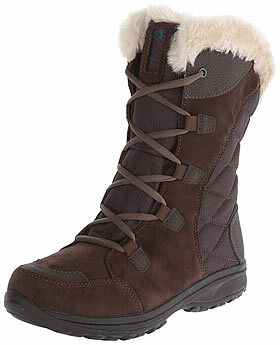 Columbia Ice Maiden II - A popular and versatile winter boot for women. Stylish warmth bundled in a lightweight package. 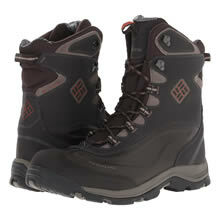 Columbia Bugaboot Plus II - This is an excellent winter boot for both men and women. Lighweight, warm and comfortable. More Columbia Winter Boots for Men - If you just want to browse the wide variety of winter boots from Columbia that haven't been reviewed in-depth here, you can view Columbia's entire collection over at Amazon. More Columbia Winter Boots for Women - If you just want to browse the wide variety of winter boots from Columbia that haven't been reviewed in-depth here, you can view Columbia's entire collection over at Amazon. Columbia Boots for Kids - Columbia has a sizable line of winter boots just for kids that are durable, versatile and affordable. You can view the entire collection over at Amazon. Winter boots from Columbia share a number of common design characteristics. The boots all use Columbia’s specialized Omni-Heat insulation. The amount of insulation varies by boot, ranging from 100 grams to 600 grams (higher the number, the warmer the boot). Omni-Heat is similar to Thinsulate in terms of warmth and density. Columbia, however, then lines the insulation with a reflective liner. This reflective liner essentially bounces back the heat—sort of how like a shiny auto-screen bounces back the light of the sun to keep a car cooler during the summer. This liner allows the boot to stay warmer while using less insulation. The result is that Columbia winter boots are surprisingly lightweight, and really don’t weigh much more than a standard hiking boot. Another unique feature found on Columbia winter boots are their superb traction. Most of their winter boots have an outsole made from Omni-Grip, which is specifically designed to provide excellent traction in wet, snowy and icy conditions. Moreover, the tread pattern of the boot has been specially designed for the snow. Finally, some styles of boots—particularly the various Bugaboots—use the Techlite Midsole. This midsole is lightweight and provides excellent cushioning. Thus, it is ideal for winter hiking. As mentioned earlier, Columbia winter boots are "winter boots," not "snow boots." 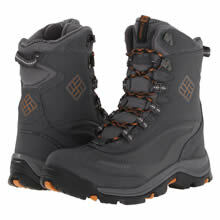 Columbia winter boots, including the Bugaboot style, lack the built-in snow gaiter found on Sorel and Baffin boots. Moreover, most Columbia winter boots simply aren’t "as tall" as most snow boots. Thus, if you plan on spending lots of time wading through deep snow, a different boot might be needed. However, if you only plan to occasionally wade through deep snow but still want the lightweight found in Columbia winter boots, then the purchase of a separate snow gaiter might just be what the doctor ordered. A separate snow gaiter is basically a piece of nylon that will wrap around the upper part of the boot and the lower leg, and prevents deep snow from getting inside the boot. Thinking of buying a Columbia Bugaboot while still using a funky colored cotton sock? Well, think again. Just like any other winter or snow boot, the use of a cotton sock pretty much ruins much of the wonderful insulating value found in the boot—regardless of who makes them or how fancy the boots insulation might be. Cotton socks and winter/snow boots are a poor mix and the leading cause of cold feet during the winter, I suspect. If you want to know more, read the Importance of the Winter Sock article for all the gory details of why cotton socks should be avoided during the winter months at all costs. Good socks for Columbia winter boots, as well as all other types of boots designed for cold weather, are those made from shearling, IsoWool, fleece and many other synthetic creatons. My favorite winter socks are SmartWool socks, but Thorlo and Wigwam both also have some socks that are excellent for winter weather.